We are pleased to announce that Blue Scientific is now an official distributor for Renishaw Raman Microscopy in the Nordic region (Denmark, Sweden, Finland, Norway and Iceland). This includes the Renishaw inVia product line, alongside the AFM-Raman already in our portfolio. The Renishaw Raman product line includes the inVia, a high performance Raman microscope renowned for its flexibility and high performance. Perform all types of Raman measurements and acquire detailed chemical information and images from a wide variety of materials. The inVia Qontor is the new flagship of the inVia product line, launched earlier this year. The Qontor adds a new dimension to the inVia’s performance and ease of use. The instrument incorporates new focus tracking technology (LiveTrack), for analysing samples with uneven, curved or rough surfaces. Focus is maintained in real time during data collection and white light video viewing. There is no need for laborious manual focussing, pre-scanning or sample preparation. This new innovation means that accurate spectra can now be acquired from materials with topographic variation. This opens up a whole new range of samples and applications that weren’t previously possible. For example, uneven geological samples can now be analysed without sectioning or polishing. Acquiring in-focus Raman images of your whole sample is now a reality. Users can track the surface live while acquiring surface or even subsurface Raman data and later view the Raman image and surface topography of their sample in 3D. This innovation not only saves time but, in some cases, allows us to analyse samples that were previously impossible to study. Raman image of quartz-dominated rock (Tiger’s Eye) imaged using 532 nm excitation and a 20× objective lens. 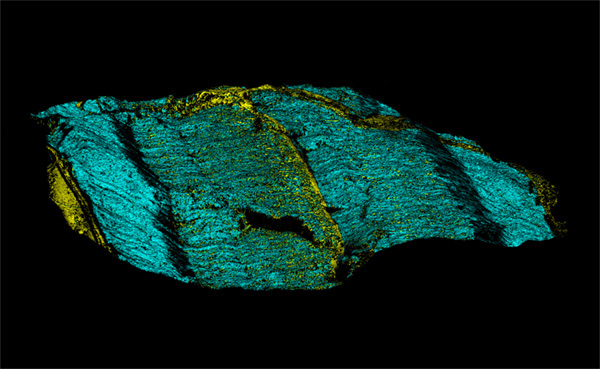 Quartz is shown in cyan and inorganic carbonates in yellow. The surface is 47 mm wide, 26 mm deep and 3.0 mm high. Renishaw is one of the world’s leading engineering and scientific technology companies, with expertise in precision measurement and healthcare. Their products and services are used in applications from jet engine and wind turbine manufacture, to dentistry and brain surgery. Renishaw has won numerous international awards, including eighteen Queen’s Awards for achievements in technology, export and innovation. In 2014 they received a Queen’s Award for Enterprise for the continuous development of the inVia confocal Raman microscope.